Conflicting emergency notifications caused confusion for the Pierce College community due to a potential threat on Wednesday, Sept. 17. The campus community received an email at approximately 11:45 a.m. stating that the LAPD was searching for a suspect believed to be armed and dangerous who may have driven into campus. Within minutes another notification in the form of a text was sent out informing the community of an immediate evacuation taking place. Minutes later, an email stating that the college was to be on lockdown until further notice due to “current police activity” spurred confusion among those currently at Pierce. “It was an adequate response. I asked for only certain units to come. It was appropriate for the information I had. If you put back on information and you judge wrong, it’d be a bad day,” Deputy Guerrero. As a result of the conflicting messages, students evacuated the campus or did not attend class at all. Some students and faculty received a message at around 12:23 p.m. notifying them that the lockdown was lifted and the campus was safe. Other students, who received the previous warning messages, did not receive that message. Administration received phone calls throughout the evening from uninformed, concerned persons asking if it was safe to go on campus. Despite efforts, some messages released by Blackboard on Wednesday were vague and unspecific. Text messages referring to Pierce simply as “the college” were particularly confusing for students enrolled and attending multiple colleges. “Every time we spend time crafting a message, it’s eating up time to get messages out to our students,” Schleicher said. Getting the message out to students, according to Schleicher, also depends on how “engaged” the students are about inputting accurate contact information into the Blackboard system. “Sixty percent of our students are potentially in the system and the other 40 percent are completely neglected because they haven’t updated their profiles,” Schleicher said. A number of students either didn’t receive these notifications or received them at later periods. “It’s a system we maintain for a lot of services. We’re trying to make it as expedient as possible but there are some latency issues,” Schleicher said. Possible reasons for this latency, according to Schleicher, are bugs within the system, but may also be due to the service speed of certain mobile service providers. Paul Nieman, Director of Facilities, suggests that the latency is due to the high capacity of people the system has to relay information to. “The number of contacts that the system was attempting to contact via text, via cell phone, via landline phone was 54,223,” Nieman said. The Center for Sciences building, known for its bad reception, has thick walls which make it difficult to receive mobile cellular service. Of the potential 60 percent registered onto Blackboard, those taking a class in the building during an emergency are less likely to receive a notification through mobile phones. “I think Pierce has been the most aggressive campus of having security presentations and other events to make everyone from faculty, staff and students aware of what protocols we have in place,” Schleicher said. Safety meetings throughout the year as well as pamphlets and booklets given out throughout campus are some ways safety instruction is distributed. Attempting to remedy the lack of reception in the Center for Sciences, hardline phones were installed and briefing faculty on safety protocol at the beginning of the semester was implemented. “Today’s example,” Schleicher said of Wednesday’s incident,” was one of the best where you have an incident you don’t have a lot of credible information initially. I’m trying to focus on the potential issue and then communicate out to other individuals. So those are things we are trying to do in a short time frame. So that was a challenge for us. I think we handled it the way we intended to handle it. Thankfully it went well in terms of no threat was present on campus and no one was injured,” Schliecher said. For audio coverage visit sister publication KPCRadio.com. Pierce College campus was put on lockdown after a man suspected of being armed and dangerous was reported of being at the Winnetka entrance. Students and faculty were notified at 11:39 a.m. to evacuate the campus, but the notification was blank with details. 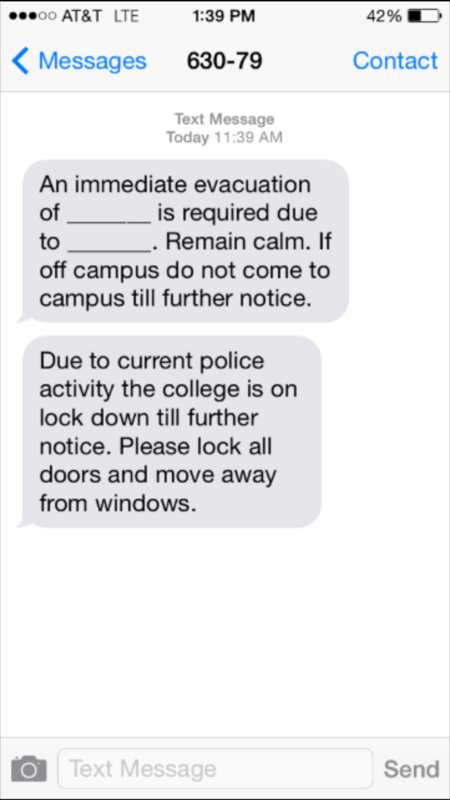 A second notification was sent out shortly after informing those on campus that a lockdown was in place, causing confusion about what was going on. One of the emails sent out stated that LAPD was following a gunman who may have driven through the campus. After contacting the LAPD Media Relations department, Police Officer Sara Faden said that someone had called reporting a suspicious white male in his early 30’s with an unidentified object at the Winnetka entrance of the school. No vehicle was reported in the phone call. Both the suspect and the individual who reported the suspect were not at the scene when LAPD arrived. The campus was lifted from its lockdown status and notified the students and faculty at 12:23 p.m.